Walk Like a Panther aims to celebrate lycra-clad wrestlers in the way that The Full Monty saluted stripping steelworkers. 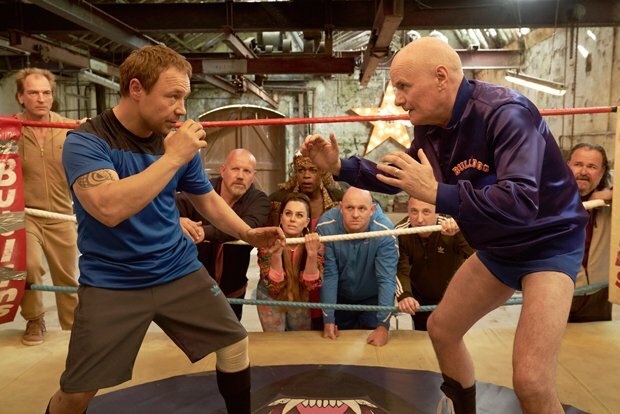 The mixture of broad comedy and shameless tearjerking is entirely predictable and mostly resistible, despite the best efforts of reliable British character actors, from Stephen Graham to I, Daniel Blake's Dave Johns. A fond prologue recalls a 1980 in which wrestling was the Saturday teatime telly viewing of choice for a large swathe of the population. Almost 40 years later, the sport in Britain has dwindled to a side show, overtaken in popularity by the American razzle dazzle of WWE. It is a particular tragedy for Mark Bolton (Graham) who always dreamed that one day he would don the spandex, flex his muscles and follow his father Bulldog (Johns) into the ring. The threatened closure of the village pub The Half Nelson is the catalyst for a group of retired wrestlers to get back in the ring for a fundraiser. That's the cue for a training montage in which the flesh is willing but the knee joints have definitely seen better days. The main performances in Walk Like a Panther have a winning sincerity but the film is pitched at the level of a garish cartoon with exaggerated characters (including corporate baddie Stephen Tompkinson) and obvious punchlines. There is little chance to explore the poignancy of the situation or find any real heart in the shenanigans, as it strictly adheres to a cheer-the-underdog formula. Liberally sprinkled with familiar television faces (Jill Halfpenny, Sue Johnston etc), writer-director Dan Cadan's feature debut feels tailor-made for the small screen. If you are one of the people that will admit to liking Mrs Brown's Boys, or who considers Still Open All Hours a guilty pleasure then you might derive some mild entertainment from this very old-fashioned affair. General release from Fri 9 Mar.